Simon & Schuster Audio, 2016. 12.75 hours on 10 discs. First, let me say that Chris Cleave’s writing is magnificent. His use of language is rich and evocative. Narrator Luke Thompson’s voice and dreamy accent is wonderful — the voices of the different characters were distinct and clearly distinguishable throughout. This is another World War II novel — but showed me aspects and details of World War II that I knew nothing about — the siege of Malta, the fate of children who were not evacuated from London, the treatment of Negroes in England, and what it was like to be in London during the bombing. But — it’s another World War II novel. Yes, I was enthralled. Yes, I was never tempted at all to stop listening. (Did I mention the author’s magnificent and evocative use of the language?) But I’m afraid, sadly, I’m getting tired of World War II stories. I’ve read so many good ones in the last year: All the Light We Cannot See, Anna and the Swallow Man, Salt to the Sea, and The War That Saved My Life. This one, I’m afraid I never was very fond of the characters. They were interesting. I liked Alistair best — but mostly it was sympathy for all he had to go through. (And his voice was the dreamiest.) The rest were all right, but not necessarily people I’d ever be friends with if they were real. And the main love story didn’t quite work for me. As far as I could tell, it was some sort of spell cast on them when they laid eyes on each other. Despite obstacles. I just couldn’t quite get behind that, even though they kept telling me how strong that attraction was. I didn’t feel like they actually knew each other well, despite some flirtatious letters (which were fun to listen in on). 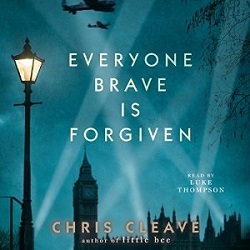 And Chris Cleave can think up horrors like no one else! He still hasn’t topped the scene in Little Bee for the most horrific scene I’ve ever read. But this was a book about war, and there were several truly awful moments. They were warranted — this is a war story. But that may be partly why I’m getting tired of World War II stories. So — I can’t stress enough that this is a well-written book that shows you the daily lives of a group of people caught up in World War II. It lets you peek into their hearts. But those are a few reasons why I personally liked and admired it but didn’t love it. If you take it up, be sure you’re ready for a story about war. This entry was posted on Friday, October 14th, 2016 at 10:45 pm and is filed under Fiction Review, Historical. You can follow any responses to this entry through the RSS 2.0 feed. You can leave a response, or trackback from your own site.